How To Specify Anodized & Painted Architectural Finishes - SAF Specifications SAF – Southern Aluminum Finishing Co, Inc.
Southern Aluminum Finishing Company (SAF) is the developer of the “SAFINISH Designation System” for specifying exterior finishes used on architectural aluminum building products. When architects specify SAFINISH, the resulting finish has the longest expected lifetime of any available for architectural aluminum. SAFINISH coatings are available only on aluminum, because aluminum is the only metal with the longevity and resistance to corrosion equal to the quality implied by the SAFINISH designation. SAF recommends SAFINISH for long-term exterior use. Ask about our five and 20 year limited warranties for SAFINISH aluminum coatings. SAF has been finishing aluminum for the construction industry since 1946. Since then we estimate that we have processed over one billion square feet of aluminum used on thousands of projects worldwide. This unequaled experience in finishing aluminum allows us the unique position of being able to give you an objective selection of the most suitable anodizing or paint finish for your application. Only the most durable finishes qualify for the SAFINISH designation. For many, specifying aluminum finishes is a difficult task, requiring references to specifications from many unrelated trade associations. Architects find the plethora of aluminum finishing specifications to be confusing at best. Our SAF SAFINISH Designation System simplifies the specifying process, while maintaining a quality of finish suitable for commercial properties. For detailed information about SAFINISH coatings click here. 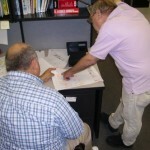 Specifiers design their buildings to last a very long time. SAF designs their finishes to last, as well, and we stand behind our products. It makes no sense to apply an inferior aluminum finish to cut costs: aluminum finishing is typically less than 1% of a project’s cost, but can be 100% of its appearance. Type: All exposed aluminum shall be given caustic etch followed by an Architectural Class **(I or II)** anodic coating with color conforming to Aluminum Association Designation ___**____. The color shall be _____**______ and shall meet standards set forth by AAMA 611. Appearance: coating shall be continuous, uniform in appearance, and free from scratches and other blemishes. Color variation: No more than 5E (CMC) when measured in accordance with AATCC 173-1989. SAFINISH coatings are recommended for long-term exterior use. Ask about our 5 and 20 year limited warranties for SAFINISH coatings. Limitations: Class II dyed finishes (SAF 804) are not exterior lightfast. Spectrocolorimeter conditions: integrating sphere specular included, 10 degree standard observer, D-65 Illuminant, CMC Ratio 1.50:1.00. Type: two-coat, shop applied, high performance, 70% Polyvinylidene Fluoride (PVDF) coating based on Arkema Inc, Kynar 500® or Solvay’s Hylar 5000® resin, formulated by a licensed manufacturer and applied by manufacturer’s approved applicator, to meet AAMA 2605. Applicator is to pretreat the aluminum with solutions to remove organic and inorganic surface soils, remove residual oxides, followed by a chrome phosphate conversion coating to which organic coatings will firmly adhere. Designation: Southern Aluminum Finishing Co, Inc. SAFINISH, SAF 266. Color: **Standard or Custom** color as selected by architect. Touch-up paint: Provide matching touch-up paint for minor touch-up of small scratches, abrasions, and fasteners. Paint shall be applied with an artist brush and never spray applied. Color variation: No more than 2E (CMC) when measured in accordance with AATCC 173-1989. Hylar 5000 is a registered trademark of Solvay Specialty Polymers Inc.
Kynar 500 is a registered trademark of Arkema Inc.
Duranar is a registered trademark of PPG Industries Inc. Need more information on How To Specify Aluminum Finishes with Confidence? CALL Southern Aluminum Finishing Co, Inc. (SAF) at 1-800-241-7429.